Ethan Aguayo leaps for a touchdown catch as Samuel Liaga of Centennial of Las Vegas tries to block during the second quarter of the Brothers in Arms Classic football game at Mission Viejo High. JSerra coach Jim Hartigan said that, on paper, this might be the best team he’s had since he began coaching the Lions. On Saturday afternoon, they looked pretty good on the field, too. JSerra dominated Centennial of Nevada in its nonleague season opener, 44-0, at Mission Viejo. The Lions’ defense stood out with seven sacks and it held Bulldogs running back Lantz Worthington to 36 yards rushing. It was JSerra’s first shutout since the 2010 season, when it shut out Fullerton, 31-0. The Lions’ offense and special teams also contributed to the resounding win. Ethan Aguayo got them on the scoreboard when he blocked a punt for a safety in the first quarter to put them up, 2-0. The offense followed with a 50-yard touchdown march, which culminated with Dante Pettis hauling in Nick Robinson’s 11-yard pass in the back corner of the end zone. Casey Eugenio, Conor O’Brien and Aguayo each added a touchdown in the first half, which swelled the Lions’ lead to 30 points. 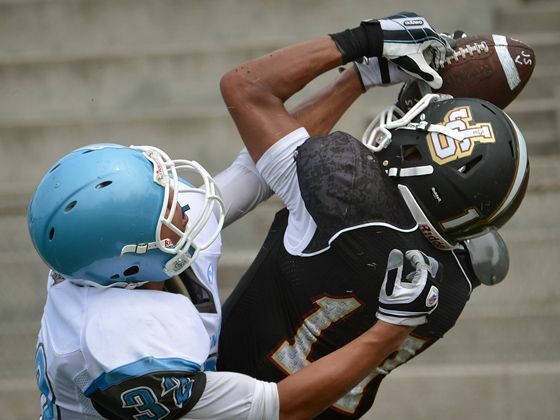 It was the first game JSerra played with its new look up-tempo offense. “We’re kind of a run-pass option team, and we had a bunch of backs going in there,” Hartigan said. “We had Pettis catching some balls, too. We want to spread the ball around as much as possible. Robinson had a good day leading the offense as he went 9 of 16 passing for 108 yards and two touchdowns. He might have had a few more completions if it wasn’t for a few drops. His play-fakes also set up some nice runs for his running backs. Eugenio led the way on the ground with 138 yards and two touchdowns. Pettis left the game in the second quarter due to some heat exhaustion, according to Hartigan. The Lions have a week off before they take on Huntington Beach at 7 p.m. on Sept. 13 at Saddleback College. For more on the Lions Football season visit them on Facebook.